The aim of near dry machining is to replace traditional coolant and pure oil flood systems in a machining environment with an accurately controlled compressed air stream that carries minimal quantities of oil lubrication in an "aerosol" format to the cutting surface. This insures lubrication of the cutting surface and allows for high performance machining. External Lubrication: oil is transported via an external nozzle to the cutting surface placed near the tool and workpiece. Internal or "through-the-tool" Lubrication: oil is transported through internal lubrication holes in the cutting tool. Reduce work cycle times, generally by 25% to 80%. Increase tool life thus increasing time between tool change and gain productivity. Better surface finish and tolerances can be achieved. Eliminate coolant - make your plant more environmentally friendly. Parts finish machining with a fine rust inhibiting oil coating - not coolant contamination. Water and oil consumption drastically reduced. Our technology works on diverse materials and machining operations. 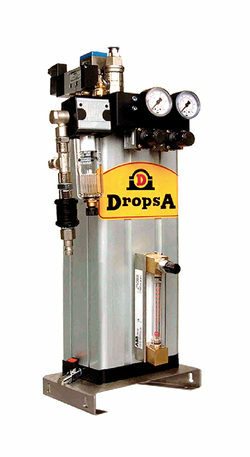 Eliminate capital cost of high pressure thru-tool coolant system on new systems. Side-by-side Implementation parallel to existing coolant system gives you peace of mind and maximum flexibility. MKD DUAL Uses Patented Auto-adaptive technology eliminating complex and continual adjustment between tool change. No complicated electronic control systems needed thanks to the patented Auto-adaptive system. Design MQL compatible tooling and coatings to optimize application results. Efficient and complete MiQueL is designed for near dry machining lubrication for machine tools, machine for cut and fold sheet metal, steel mills, it can be used on all the systems that need a calibrate lubrication and a functions control. It is possible to insert till 8 elements connected among themselves that, anytime, can be excluded or activated singularly, through integrated electro-valve. Useful and easy to use for each single element it is possible to control individually oil and air delivery. Clean: The system includes a device that, completed the lubrication cycle, guarantees that the lubricant does not drop. The MKD-Dual minimal lubrication system represents the first step towards the world of near-dry machining by using the leading air-oil aerosol technology. Designed for internal lubrication processes, this exclusive unit can generate a thin film of aerosol mixture which is brought directly to the tool cutting point by using the existing fluid distribution channels found on most machines. Dual Venturi based aerosol generator will automatically compensate when going from one size of tool to another avoiding the deterioration of the aerosol quality that is found when varying the linear velocity of air through the Venturi. MKD-Dual therefore optimizes the process through an automatic adjustment of the micro-oil mist depending on the air flow - this means best aerosol quality throughout the different sizes of cutting tool and a considerable time saving on initial setup (no complex regulation). 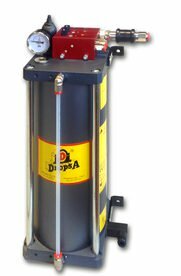 MKD-Dual has been designed mainly for mid-high range applications - this sophisticated technology of generating an ultra-thin aerosol with sub-micron particle size allows the mixture to flow through the spindle during rotation at high speeds minimizing the effects of centrifugal force on the aerosol avoiding deterioration. The Dual unit is provided with two outlets which can be supplied with electro-pneumatically controlled ball valves. Interested in learning more about minimal quantity lubrication? Contact our specialists today!